WOO HOO!!! Let the joyous news be spread! It’s time for. . . The 4th Annual Holiday Contest!!!! The Judging: My lovely assistant(s) and I will narrow down the entrants to 10-12 finalists (depending on the number of entries) which will be posted here on either Monday December 15 or Tuesday December 16 (depending on the number of entries :)) for you to vote on for a winner. The vote will be closed on Thursday December 18 at 5 PM EST and the winners will be announced on Friday December 19. Whoever gets the most votes will be first and so on down to tenth place. Judging criteria will be kid appeal/kid-friendliness, creativity of weather use in plot, quality of story, quality of writing, and originality. – A picture book manuscript read and critique by Shari Dash Greenspan, Editor of the multi-award winning Flashlight Press! I encourage you to sign up for their newsletter HERE! – A picture book manuscript read and critique by Jennifer Mattson, Agent at Andrea Brown Literary Agency! – A website or blog design or redesign by Arturo Alviar. Arturo will design (or redesign if you already have one that needs updating or a new look) a website or blog for the winner of this prize. The site will be built on WordPress so that after he is done designing it, the winner can manage it themselves with ease. Arturo will include a Home/Welcome page, an About Me/Bio page, a Works/Books/Gallery section, and a Contact section (4 pages total), as well as a blog section if the winner would like to have that integrated with the new site. Different organizations can also be made, for example if the winner would like a “Services” section with separate “School Visits” and “Critiques” pages, or a “Works” section divided into “Black and White” and “Color” illustration galleries. The winner can choose any of the WordPress themes (if they choose one that isn’t free, the cost of the theme will be covered by them), or have Arturo choose a theme based on their vision, and Arturo will modify it based on their color and layout preferences (some themes will have more constraints than others). Arturo can also design a personalized banner or header image to customize the website. If you already have a website and/or blog and prefer a redesign to update, refresh, or just redecorate, Arturo is willing to work with Blogger, Wix, Drupal, and WordPress. – A picture book manuscript critique by fabulous author Amy Dixon, author of MARATHON MOUSE and the forthcoming SOPHIE’S ANIMAL PARADE. – A picture book manuscript critique from Katy Duffield, author of more than 20 books for children including Farmer McPeepers And His Missing Milk Cows (Cooper Square Publishing 2003) and upcoming titles Loud Lula (Two Lions) illustrated by Mike Boldt and Aliens Get the Sniffles, Too (Candlewick) illustrated by K.G. Campbell. – A picture book manuscript critique (rhyme or prose) from Penny Parker Klostermann who, after extensive experience critiquing for writing partners, members of various kid lit groups, and clients of Erin Murphy Literary Agency, is opening her own critique service!!! Penny Parker Klostermann writes picture books and poetry. Her debut book, THERE WAS AN OLD DRAGON WHO SWALLOWED A KNIGHT, is coming from Random House Children’s, August 2015. Penny is represented by Tricia Lawrence of Erin Murphy Literary Agency. Click HERE to learn more about her critique service. – 2015 Children’s Writer’s & Illustrator’s Market, a signed copy of Boy And Poi Poi Puppy by Linda Boyden, and a $25 Amazon Gift Card. Heated the earth to one hundred degrees! And he sent all his reindeer to chill in the pool. In time for his once-a-year Christmas Eve trip. 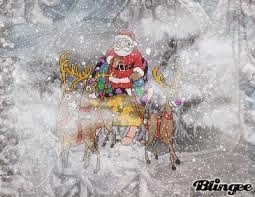 But HEAT didn’t trouble St. Nick as he drove. As his journey continued, the temperature dove. — Fog tiptoes in on its little cat feet! “This just in! Here’s the hot-off-the-presses news scoop! To ensure each child’s Christmas was merry and bright? Christmas morn was abandoned to think up a plan. Kids spilled from warm houses and met in the street. “Santa comes through for us year after year. They climbed to their roofs with whatever would shine. With candles and glowsticks and lights from their tree. So Santa could finally find his way home. “It’s official!” the newsfolk were happy to say. And Santa? He took a long afternoon nap! I can’t wait to read all of your (much better!) stories! I hope there will be a lot – the more the merrier! And there are still 4+ days to write, so you have time if you haven’t written yet and want to join the fun. Feel free to spread the word to your writing friends as well. Remember to put your post-specific link (not your general blog link or people will find the wrong page if you post again before the contest is over) in the list below! Don’t miss the 37 fabulous entries in the comment section! Click on the names or titles to go to the story. Please note that it takes a minute to load. And please also note that clicking on these links will allow you to read the story and leave your own comment, but not see previous comments left on that story… I don’t know why… so if you want to see all the comments left on the story, you’ll have to scroll through the whole comment section. Anne – What Will Santa Do? Rene – Best Christmas Ever! The 4th Annual Holiday Contest Finalists – Vote For Your Favorite!!! Is anyone else having trouble posting comments on Blogger? I write out my comment, set it to post with my WordPress ID and then his submit. Instead of giving me time to type in the “anti-robot/spam” numbers, it flashes the numbers for a moment and then goes back to the screen where I typed my comment without recording it. Frustrating. Clearly, Blogger doesn't like me or my comments. Thank you so much. This contest was fun. Ha! What a clever take on the idea. Agave syrup…cute! Santa savings time!!! Love it. Great piece! Oh, phew! I'm sorry for the trouble with other blogs, but glad it's not mine, which causes enough trouble already! 🙂 Thanks for letting me know! So many great stories. Way to go writers! 🙂 love the stories.